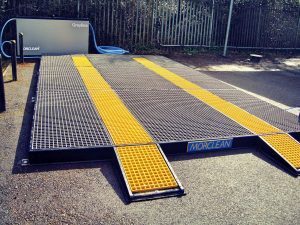 The latest wash pad and interceptor to be provided by Morclean has been delivered to a company in Surrey that specialises in the recycling of used textiles, clothing and shoes. The organisation works with many UK local authorities, supermarkets, waste companies and clothing retailers to collect and recycle unwanted textiles. Every day in the UK approximately 2,000 tonnes of clothing and shoes are sent to landfill! Requiring equipment to aid in the washing and maintenance of their vehicle fleet, Morclean provided a permanent wash pad complete with the semi-portable Blue Box interceptor system which recycles the effluent produced and contributes to the green ethos of the company. The permanent surface mounted wash pad is a sealed bund made from a mixture of welded plastic and fibreglass panels, making a solid, impermeable and dedicated liquid containment area for tough applications. It is typically used in heavy duty environments where there is a need to wash higher volumes of vehicles. Morclean offers interceptor boxes to work hand in hand with the wash pad and process the waste water that is collected. The Blue Box was provided for this project and removes the need for a below ground interceptor. It has two stages of settlement and a bag filter to take out particles such as silt, oil and grease. When connected to the wash pad, an integral pump processes the waste water collected from the pad and discharges it to foul drain. Morclean also offer the Grey Box which is similar to the Blue Box but relies on gravity to process the water through the filters and partially treats the water. Wash pads can be tailored to the customer’s needs and come in customisable sizes and colours. To find out more about the wash pad range and interceptor boxes available at Morclean you can view the range online here or call us today on 01246 471147.